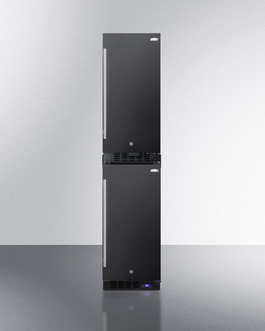 SUMMIT Stack15 lets you combine our 15" wide refrigerator and freezer into one slim-fitting unit. Perfect for micro-apartments and other space-challenged homes, this kit lets you enjoy the convenience of the fully featured FF1532B all-refrigerator with the frost-free SCFF1533B all-freezer in just 15" of floor space. You can also use this with the SWC1535B wine cellar or SCR1536BG beverage center. An anti-tip bracket is included for added safety. Some assembly is required.